Long before Tofurkeys roamed the earth, meatlessness was already a thing. 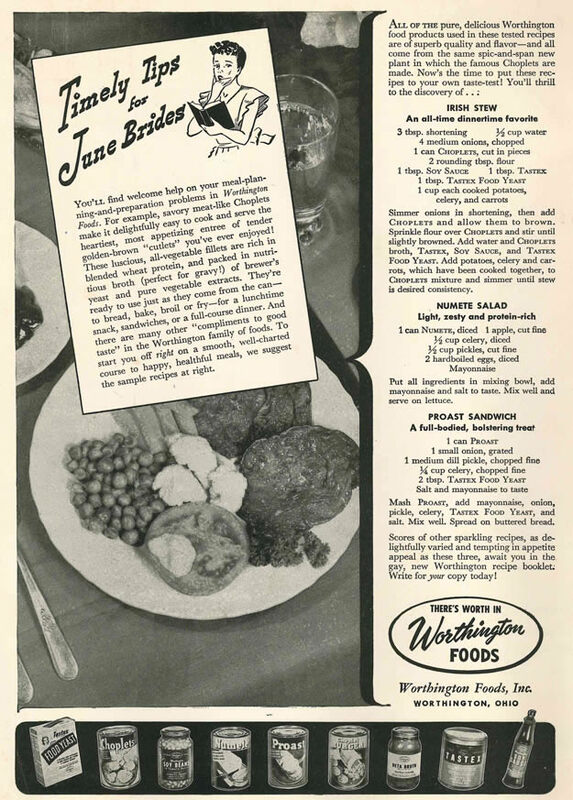 Back in the 40s, Worthington Foods was there leading the way with vegetarian comestibles, ironic quotation marks and horrible product names indicative of the era. Let’s examine several of them! Believe it or not, Choplets are still being made, albeit now under the name of Loma Linda, the “leading producer of shelf stable, sustainable plant-based proteins in North America”! Yum? It’s pretty easy to figure out where the Numete name comes from, but the Proast portmanteau is a tad more mysterious. P(lant)ROAST? P(retend)ROAST? P(hony)ROAST? P(seudo)ROAST? P(aedophage)ROAST? The world may never know. 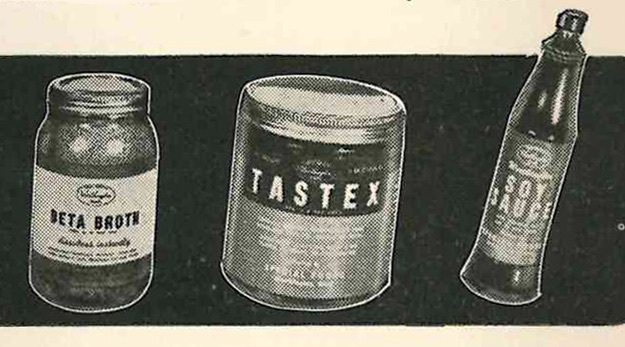 it appears that Tastex was some sort of yeast extract, but its name makes me think it also encouraged pooping. One thing’s for sure, though — None of these are SPAM. You’ll find welcome help on your meal-planning-and-preparation problems in Worthington Foods. For example, savory meat-like Choplets make it delightfully easy to cook and serve the heartiest, most appetizing entree of tender golden-brown “cutlets” you’ve every enjoyed! These luscious, all-vegetable fillets are rich in blended wheat protein, and packed in nutritious broth (perfect for gravy!) of brewer’s yeast and pure vegetable extracts. They’re ready to use just as they come from the can—to bread, bake, broil or fry—for a lunchtime snack, sandwiches, or a full-course dinner. And there are many other “compliments to good taste” in the Worthington family of foods. To start you off right on a smooth, well-charted course to happy, healthful meals, we suggest the sample recipes at right. This entry was posted in ads of yore and tagged ads, advertisements, advertising, magazine ads, meatless, print ads, vegan, vegetarian, vintage, vintage ads, vintage advertisements, vintage advertising, worthington, worthington foods on January 26, 2017 by Clayton Hove.